The majority of OSHA citations result from improper or lack of Lockout/Tagout procedures, documentation, annual inspections or other elements. 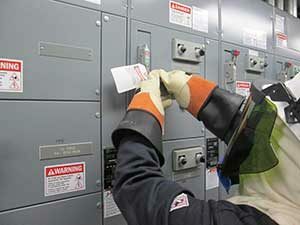 Lockout/Tagout is a critical component for safeguarding employees who operate and maintain equipment. Electrical Safety Specialists - ESS will take the aggravation out of developing your lockout/tagout procedures by optimizing your lockout/tagout program to help you save lives, time, and money. In a short time ESS will bring your facility up to compliance and train employees which will allow you more time to deal with other issues. ESS will provide the necessary tools to maintain your LOTO procedures for years to come. ESS will provide the necessary tools to maintain your LOTO procedures for years to come. Contact Electrical Safety Specialists today with any questions or to schedule Lockout/Tagout Custom Program and/or training. The first step is to identify all equipment located throughout your facility that will require LOTO procedures. The information of that equipment will be gathered and entered into Electrical Safety Specialists customized LOTO software. During this step our technicians will identify and capture images of the equipment, all hazardous energy sources and lockout points. If it has more than one source of energy (including non-lockable energy such as gravity, spring, thermal, kinetic, etc.) then it needs a procedure. The equipment procedures will be developed in accordance with OSHA CFR 29 1910.147 based on the information that was collected during step 1. 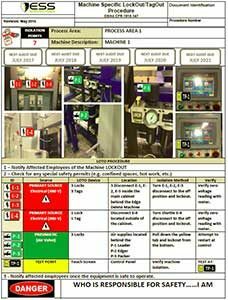 The procedures for each piece of equipment will clearly and specifically identify the scope and the process which needs to be performed to help increase employee understanding and safety. Procedures will be sent the customer for review to ensure accuracy and approval for printing. Procedures may be written for the equipment as a whole or for a specific process or task such as mold change, valve change, or similar task that occurs frequently and does not require the entire piece of equipment to be locked out. You should post multi-lingual procedure if you have a multi-lingual work force. ESS will print, laminate, and install LOTO procedure placards on each piece of equipment. Various mounting styles will be utilized depending upon the environment, location, and type of equipment. During the label application an ESS technician will also provide training for authorized and affected employees, this is generally a four-hour training. Often times AUTHORIZED employees are mistaken for AFFECTED employees. OSHA requires two types of training for lockout/tagout. Authorized employee: An employee who locks or tags machines or equipment in order to perform servicing or maintenance. Affected employee: An employee who is required to use machines or equipment on which servicing is performed under the Lockout/Tagout standard or who performs other job responsibilities in an area where such servicing is performed. Authorized employee typically consists of maintenance workers, electricians, and outside contractors. Authorized employee training will gain knowledge of when and how to apply lockout/tagout, how to handle group lockout, and shift change. Authorized employees are the ones who will lockout and service the machines. Affected employee typically consists of administrative staff and machine operators that work near the machines. Affected employee training will consists of their responsibilities to the program and the scope and purpose of the lockout/tagout program. 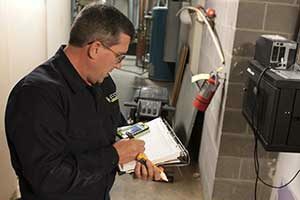 OSHA and NFPA 70E require that all procedures in the facility shall be audited annually to ensure it accuracy of the equipment’s energy sources, as well as audits of authorized employees to ensure they understand their responsibilities and proper techniques of the lockout/tagout procedures. Annual audits identify and correct deficiencies in the procedures, program, and employee performance. Audit of written lockout policy. Audit of equipment or machine specific lockout procedures, to ensure each procedure accurately reflects the equipment’s energy sources. Audit of authorized and affected Employee lockout work procedures and processes. We are truly a one stop shop for all your electrical needs. We provide Arc Flash Assessment, Electrical Safety Training, Electrical Thermal Imaging, LockOut/TagOut Custom Programs, Design of Electrical and Mechanical systems for commercial and industrial projects, Breaker and Transformer Testing, Preventative Maintenance, installation and repair of existing or new commercial or industrial equipment.